Nancy Hale: On the Life & Work of a Lost American Master. The contributors’ essays make it clear they have a great appreciation for Nancy Hale and her work. What for you was the definitive reason Hale needed to be included in the Unsung Masters Series? Nancy Hale shared an agent (Maxwell Perkins) with Ernest Hemingway and F. Scott Fitzgerald, one who believed that she would one day be as canonical a writer as Willa Cather or Eudora Welty. She was a rare writer who excelled in both the long form and short form fiction. 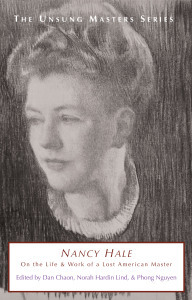 She also wrote nonfiction about the artist Mary Cassatt, and a book on writing fiction that influenced a generation of writers. Because of her mastery of her genre, and because of her influence on other writers, I felt that she should not be forgotten. With so much impressive work to choose from what were the deciding factors for a piece of her work being included as opposed to all the others? Nancy Hale’s most successful book was a novel entitled The Prodigal Women. It was a best-seller in its day, though it has since gone out of print. Clearly, it would be impractical to republish a 500-page book, so I had to choose among a body of work that included half a dozen short story collections. A couple of them were my personal favorites, and the rest of them were chosen based on the essays I received– I wanted the reader to be able to reference the stories being discussed in the volume. The contributors all had very glowing opinions to express in the introductions and essays that appear in the collection. Was Hale a writer that had a cult following of fans in the literary community, or was the making of this volume many of the contributor’s first significant experience with her work? Part of the challenge of putting together a volume like this one is finding an author obscure enough to be worth rediscovering, then finding enough people who know and love that obscure author to fill a book. In the case of Nancy Hale, once I found her granddaughter Norah Hardin Lind, she was able to put me in touch with many writers who were familiar with the author’s work. Only two of the contributors–Trudy Lewis and Debra Brenegan–were reading and responding to Hale’s fiction for the first time. Hale’s work in the volume holds up very well to time. Not only considering the subject matter she wrote about, but also stylistically. Do you believe her body of work still resonates with the literary community? And to the reading world at large? I believe that Hale still has a lot to teach contemporary writers. As you mention, her style still feels very current because she did not adopt many of the modernist modes of writing. Her parents were both visual artists who painted portraits– very traditional but very enduring– and in some ways Hale was the same way. She is a classic storyteller concerned with the “eternal verities” rather than adopting the aesthetics of the zeitgeist. Are there any writers you can think of that you would consider spiritual successors to Hale and her style of writing? Ann Beattie, for one, whose essay is reprinted in the book. Maybe Marilynne Robinson, who also defies expectations of style and subject. It’s difficult to say because she is virtually unknown to the present generation of writers. Those that love her work and are trying to rediscover it (such as Dan Chaon and myself) don’t necessarily write like her, but simply appreciate her mastery. Justin Bieber, after visiting the home of Anne Frank, recently said that he hoped Frank would have been a “Belieber,” do you think Hale would have been a belieber? Are there any current trends in culture you think she would have latched on to? Ha! I doubt she would be a belieber, but I bet if she were writing today she would be more sexually explicit in her work, like Mary Gaitskill or Erica Jong. She was known in her day as a New York and Boston socialite, and that means something very different in the 21st century.